The holiday seasons greatly inspire many of our floral designs. We find inspiration in the festive colors, change of seasons and all the warmth associated with those special times of the year. Our design philosophy is rooted in being bold; and not overtly predictable when designing holiday floral arrangements. We believe the mood of the occasion should influence the materials we choose as well as the design style of the composition. We explore every detail of flowers and foliage to find inspiration from elements such as the line of the stems, the receding colors, the texture of the leaves. We also select a container that will complement your arrangement. We love the challenge of designing florals that are aesthetically pleasing compositions using line, form and space, color balance, patterns and textures. We make sure every design is appropriate to the environment and we never underestimate the power of fragrance when enjoying flowers. Into the jungle contains exotic textured prints and patterns encompassed by brilliant muted tones of jungle hues that voice a passionate call for the wild. 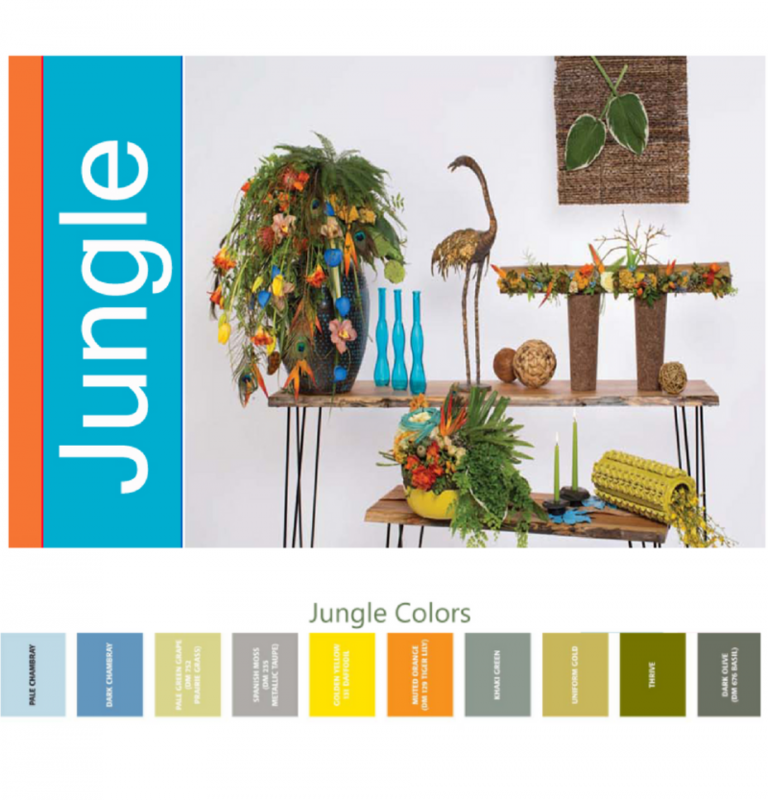 The allure of this refreshing, gentle trend reminds one of a warm summer tropical rain as the colors of the jungle radiate throughout the surroundings. Sun-kissed shades of orange, yellow, and red glisten alongside tropical foliage, mosses, vines, cork, and bamboo. An array of calla lilies, bird of paradise, and heliconia uniquely come together in hand-crafted woven baskets showcasing an earthy and organic appearance. Into the jungle’s ethereal tranquility shimmers in a flowing fashion that embodies a sunlit glow only the wild can produce. Force of nature invokes serene shades of blue and green, harmoniously connecting man and nature. One cannot escape the force of nature’s free and casual nautical themes overflowing with garden wonders. The soft blue patterns contrast with the aged metallic finishes to create a peaceful texture. Bundles of mono-botanical irises gather together in cobalt vases as frosted floral graphics adorn glasses with a subtle pattern. Heirloom roses come alive in artesian flared glass vases alongside variegated foliage, ferns, and stem-dyed flowers. The textural pods of scabiosa and nigella combined with the elegance of orchids and hydrangeas provide force of nature with a pop of ocean blues to complement the natural greens. Letting nature take its course. Dramatic, with plenty of effects and a touch of glamour – this year, Christmas is set to be decidedly festive! Festive is born of hot, bright, intense colors inspired by hand crafts, fabrics and beads; unusual and quirky tones are clearly apparent in this style. There is extravagant use of fur, feathers, yarns as well as bohemian animal motifs. 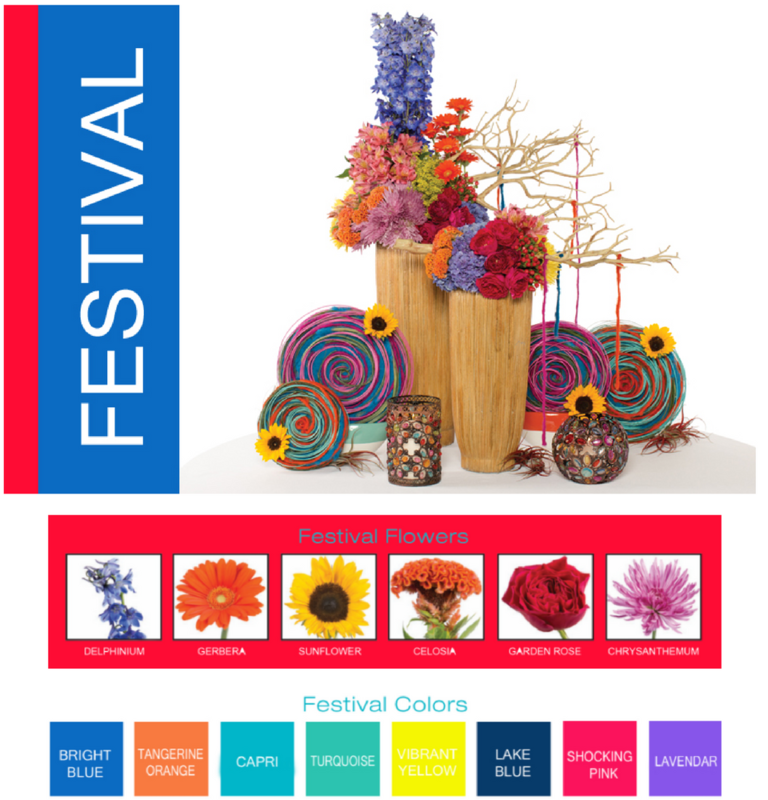 Festive vessels are made of wood, pottery, tinted glass, and brightly painted ceramics filled with loose organic flower arrangements. Opulent metallic continues to be an important color trend, exuding warmth and restrained elegance. It can be found in elements of gilded or metal plated candles, glitter, sequence, chain, and jewelry. 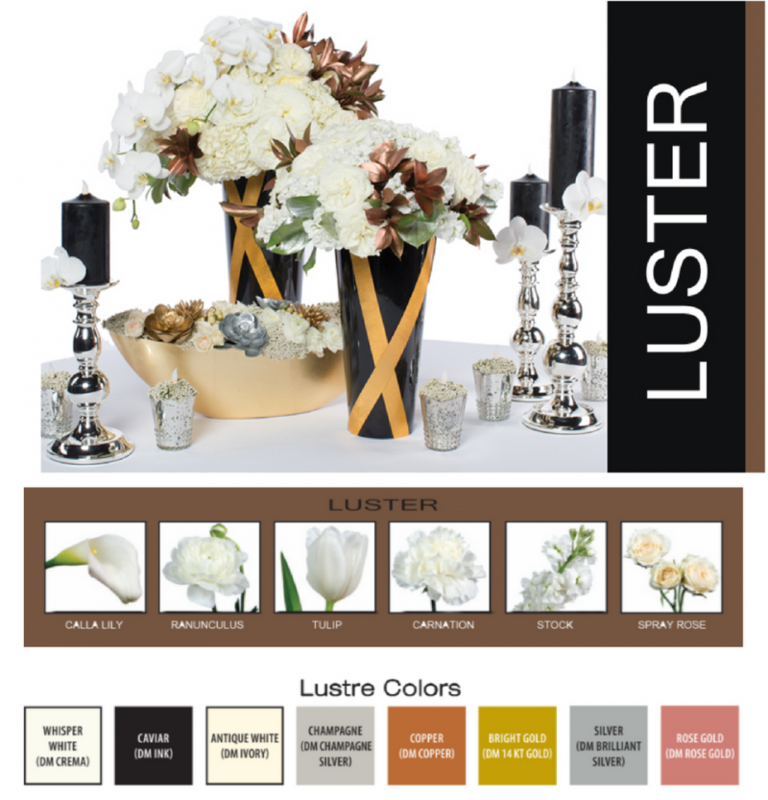 Combined with pure white flower combinations, colors or mercury, clear glass and high sheen vessels, the theme of Luster only brings life to seasonal decorations. When sensitively accented with dusky pink, there emerges a delicate, almost feminine and romantic composition. Bold texture and natural elements is the major trendsetter for seasonal decoration. 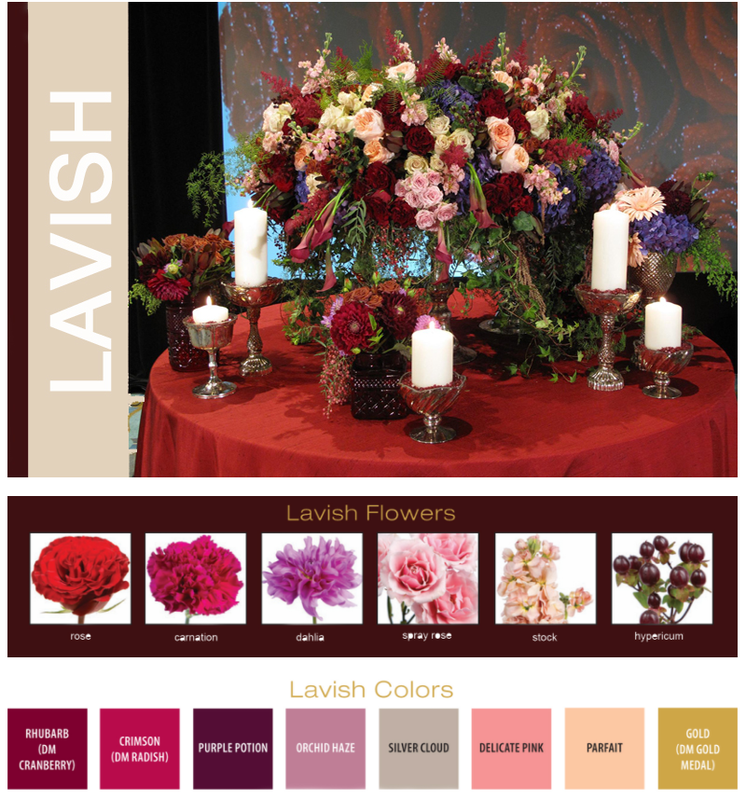 Accordingly, garden style foliage such as seeded eucalyptus, pepperberry, peonies, dahlias, hydrangea, garden roses, and amaranthus grouped and draped loosely laden with lavish colors. Gorgeous soft pinks contrasted with rich plums and crimson designed in vessels made of wood, bark, brushed gold, and vintage containers. Its sweet colors and geometric accents are polished and refined. Sorbet is a combination of pastels and brights. The style is young and fresh with a nod to mid-century modern style. 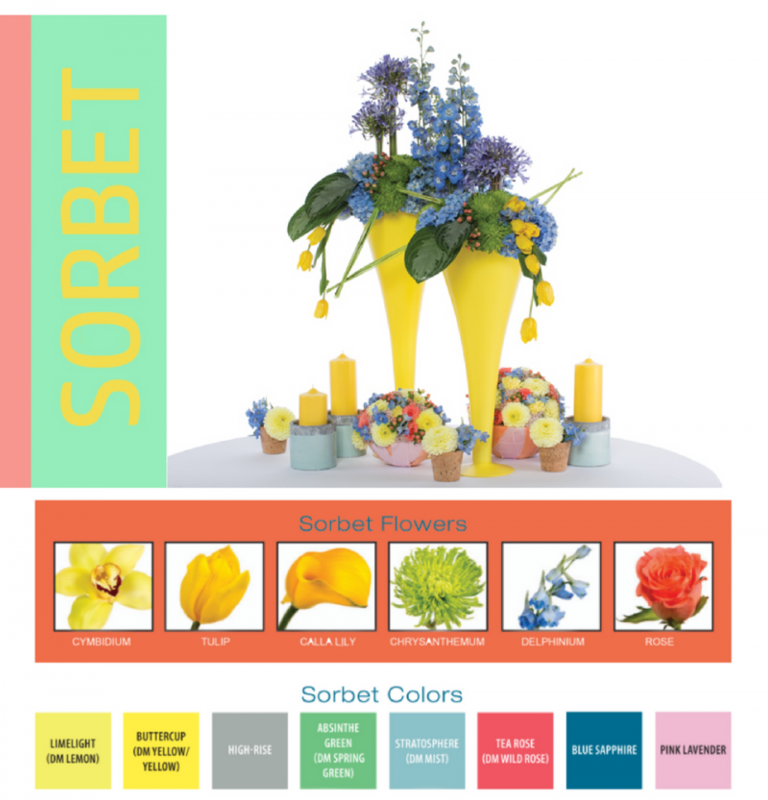 The Sorbet bride loves bright and sassy and combines colors brilliantly to tell the story of her event. 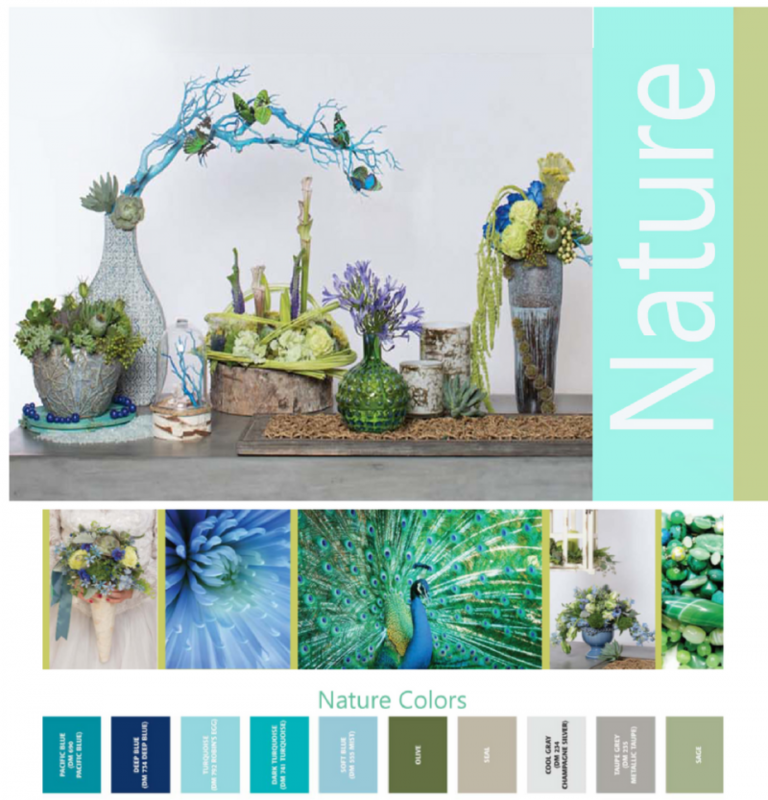 The color palette features lemon-yellow and adds to it rich blue, coral, spearmint, lavender, powder blue, and dove grey. The soft colors are an unexpected contrast to the geometric forms in the flowers and accessories. 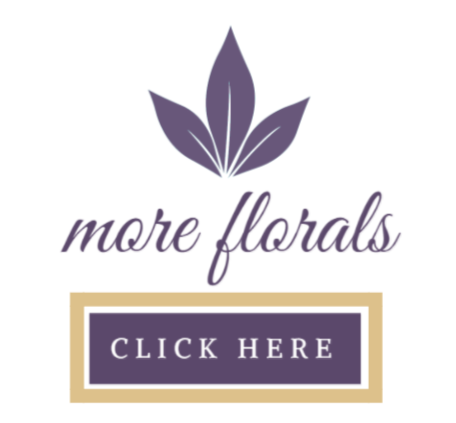 Softly textured flowers, such as peonies, ranunculus, dahlias, delphinium and tulips, are arranged in beautiful containers that are both geometric and naturally textured.